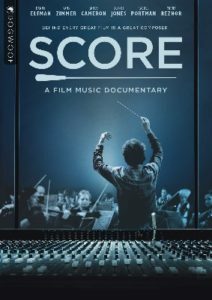 Score: A Film Music Documentary, 2016. Featuring Hans Zimmer, Danny Elfman, John Williams, James Cameron, Trent Reznor, Quincy Jones, and Howard Shore. 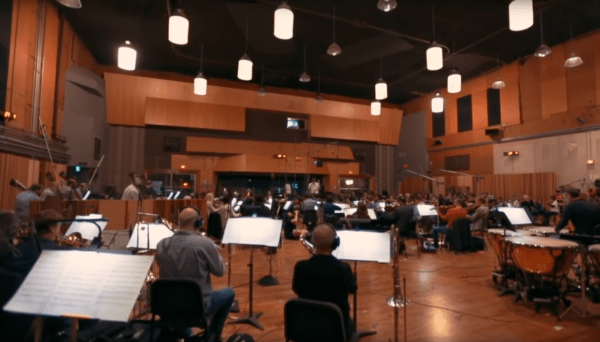 A documentary detailing the role of the film score and the people who create them. Reviewing a documentary can often be a futile exercise, more often than not resulting in preaching to the converted about a subject with little appeal outside of a select core of diehards. 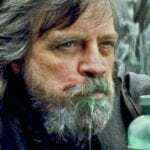 However, everybody has heard, been affected by or even, casually and without realising it, whistled the theme tune from a movie, be it from Rocky, James Bond or Star Wars. Hell, in the cases of Jaws or Psycho the theme tunes have transcended being merely whistled or hummed and have taken on a life of their own in pop culture, resulting in descriptive hand actions or simply just being the byword for mimicking terror. And so we have Score: A Film Music Documentary, the debut feature by Matt Schrader, in which the hallowed music score is given a thorough examination by some of its creators and a few other notables, from the movie theatre organ players of the silent era (which, according to writer Jon Burlingame, didn’t really exist as “Film was never silent”), through the innovative use of a full score in King Kong in 1933 and the big band sound of the 1960s, and into the modern blockbuster era with the likes of Jerry Goldsmith (The Omen/Planet of the Apes) and John Williams (Raiders of the Lost Ark/Superman) leading the way for Danny Elfman (Batman) and Hans Zimmer (Pirates of the Caribbean/The Dark Knight). But rather than delve deeply into the various composers, their most famous works and the directors that have guided them, the documentary takes the route of relaying facts without ever really getting to a point other than the obvious ‘music adds that extra something’ notion, an example being replaying the shower scene in Psycho without Bernard Herrman’s iconic score. Yes, it totally changes the dynamic of the scene and makes it less urgent and emotive but we knew that already so what are the filmmakers telling us that we cannot decipher for ourselves from years of watching movies? But whatever the message of the film, it doesn’t do any harm to be reminded of some of the classic theme tunes that have graced the silver screen and, eventually, our living rooms since the dawn of cinema, and seeing footage of John Williams conducting his orchestra at Abbey Road Studios during the recording of Star Wars: Episode I – The Phantom Menace is almost as exhilarating as the battle sequences the music accompanied during the movie, proving that the footage may not work without the music but the music can still work without the footage. Again, nothing revelatory there but it does stir the senses seeing it come together, although it would have been a bit more interesting to hear Williams talk about the process of putting it together with George Lucas’ visuals. Williams is shown through archive footage, a lot of it discussing some of his themes with Steven Spielberg, and George Lucas is conspicuous by his absence and that highlights the other aspect of the film that could have been built upon – the contribution of the movie directors whose work is augmented by these scores. James Cameron (Aliens/The Terminator) is on hand to add some perspective and shares a few stories, mainly about Titanic, but considering the movies that are shown during Score there are precious few directors or producers offering their experiences. And where was John Carpenter in all of this? No mention of Halloween, arguably the most iconic horror movie theme since Psycho, and no sight of the man who has scored the bulk of his own movies. Nevertheless, Score: A Film Music Documentary still gives you enough of an idea, albeit a basic one, of how a memorable music score can make all the difference and sometimes elevate a movie that may otherwise have been forgotten about – or at least not been quite so memorable – into the public consciousness. For dedicated cinephiles there’s nothing here that is revolutionary or deeper than the surface level questions of what a score adds to a movie but for a brief history of film scores and as an introductory piece to some of the faces behind the music it does what it needs to do and that is to get you listening a little harder to some of your favourite movies and perhaps cocking an ear to the scores of ones you watch in the future.